Did Ronald Tammen cross paths with Richard Colvin Cox? - A Good Man Is Hard to Find - My Search for Ronald H. Tammen, Jr.
Did Ronald Tammen cross paths with Richard Colvin Cox? Happy New Year, Good Man followers! Did you know that January 2018 marks the 68th anniversary of another person’s disappearance from his college dorm? That individual is Richard Colvin Cox, from Mansfield, Ohio, who was a sophomore cadet at the U.S. Military Academy at West Point, in New York, in 1950, the year he disappeared. On the day he went missing, Cox had been watching a basketball game with roommate Deane Welch, and, on their return to their room in the North Barracks, he took a detour to check his grades. While in that vicinity, Cox ran into an acquaintance who had visited him the previous weekend—a person he’d known in Germany while he was in the Army who supposedly went by the name of George. After a brief conversation, Cox headed back to his room to change into the requisite uniform before going to dinner at the Thayer Hotel with his visitor. At 6:18 p.m., he said a quick goodbye as Welch preceded him out the door, and was never heard from again. Both were from Ohio. Tammen was from Maple Heights, a Cleveland suburb, while Cox was from Mansfield, a small town between Cleveland and Columbus. Both were intelligent and studious. Both were considered leaders in their class. Tammen was a counselor in Fisher Hall, and Cox was voted by his classmates as the highest-ranking yearling (the term used for sophomores at West Point) in his company. Their birthdays were only two days apart, though Tammen was five years younger than Cox. Cox was born July 25, 1928, and Tammen was born July 23, 1933. Both were considered friendly, but private. They tended to keep things to themselves. Both were handsome with similar smallish builds. Cox was 5’8” and 165 lb. ; Tammen was 5’9” and 175 lb. Both came from families of modest means. Cox’s family owned an insurance agency in Mansfield, however Mr. Cox had passed away when Richard was 10. Tammen’s father worked as a clerk for the Brotherhood of Locomotive Firemen and Enginemen in Cleveland. Both disappeared while they were sophomores in college. They disappeared within three years of each other. Cox disappeared Jan. 14, 1950, and Tammen disappeared April 19, 1953. They disappeared on a weekend—Cox on a Saturday, and Tammen on a Sunday. They disappeared at the end of the day. Cox disappeared a little after 6:15 p.m., while Tammen disappeared sometime between 8:00 and 10:30 p.m., based on varying accounts of his final moments. Both young men appeared to be showing signs of stress or inner conflict. Cox sometimes shared that he was growing fed up with West Point, while Tammen had spoken of being “tired lately” and had been seen reading the Bible several times, which was considered out of character. Both seemed to be in good spirits on the day of their disappearance. Both walked away with just the clothes on their backs and little money. Both had supposedly been sighted after-the-fact by people who knew them. Cox was reportedly spotted in March 1952 at a restaurant in the Greyhound bus terminal at 11th Street and New York Avenue, N.W., in Washington, D.C. Ernest Shotwell, a friend of Cox’s from their days at the Stewart Field Prep School in New York, had seen him sitting at a table, and they spoke briefly, though Cox appeared uncomfortable and left shortly thereafter. (The Greyhound building is still there, a curvy, Art Deco blast from the past now bordered on three sides by more modern—and boring—structures.) Tammen was potentially seen in a restaurant in Wellsville, NY, in August 1953, by H. H. Stephenson, the housing administrator at Miami who had given Tammen permission to have a car on campus. Stephenson had walked out of the restaurant without saying anything to the young man. Both men’s fingerprints were on file with the FBI when they’d disappeared. Tammen’s had been on file since 1941, when he was in the second grade, and Cox’s was on file at least since he’d enlisted in the Army in September 1946. After committing significant resources and manpower into finding the young men, the FBI ostensibly, failed to solve either case. The Greyhound bus terminal, in Washington, D.C., where there had been a potential sighting of Richard Cox in 1952. Finding the similarities compelling, in June 2011, I submitted a FOIA request to the FBI seeking all documents that they had on the Richard Cox investigation. At that time, I hadn’t yet come to fully appreciate the nuances of FOIA—and by “nuances,” I mean, well, let’s just say that it isn’t an exact science. People at the agency of interest are likely to make judgment calls on a regular basis. Some decisions may hinge on the topic in general, the way a request is phrased, and any number of factors. With that said, the FBI saw fit to send me 24 pages on the Cox case within the same month of my request. (They told me that they were sending me information that had already been processed for another requester, which is the probable reason behind the quick turnaround.) As with my FOIA documents on Tammen, the amount seemed surprisingly small to me, considering the fact that Cox had been affiliated with the U.S. Army, and the military doesn’t take disappearances from its ranks lightly. Nevertheless, I moved on without submitting an appeal. I had little knowledge of the case at that point and 20-odd pages seemed to be the FBI’s M.O. when it came to men who’d gone missing in the 1950s. Of course, I realized that it had also been roughly 30 years since they’d submitted their FOIA requests, and a lot of purging can happen in that amount of time. Still, I thought it was worth a try. The one thing I had going for me was that, because Richard Cox had been declared dead by the state of Ohio in 1957, there was no need to provide proof of death or third-party authorization. Incidentally, I wasn’t re-requesting the Cox files to be a thorn in anyone’s side or because I didn’t have anything better to do. I was trying to locate the source of a certain piece of information that had been mentioned on page 97 of Marshall and Maihafer’s book. What to most readers appeared as a footnote of little consequence seized my attention as if it had been written in blazing, buzzing neon. What kind of a crazy coincidence would it be to have one inexplicably missing person turning up in the same tiny university town just prior to someone else going inexplicably missing? What’s more, wouldn’t it be incredible if Richard Cox and Ronald Tammen had actually known one another? The book said that all of the leads turned up nothing. Still, I had to see the documents for myself. I feel compelled to point out here that the documents I received from the FBI weren’t electronically searchable. They’re PDFs of old, difficult-to-decipher pages that require reading. Lots and lots of reading. On evenings and weekends, and even during a trip to Switzerland, I’d insert one of the CDs into my laptop and, folder by folder, wade through the bureaucratic minutia of names, places, and dates, until I was bored out of my mind, my lower neck muscles were screaming, or both. Periodically, I’d have to reassure myself that this wasn’t a colossal waste of my time. It took months for me to get through them all. As I was nearing the end of the third CD, when I’d just about given up hope, I found the reference to Oxford, Ohio. 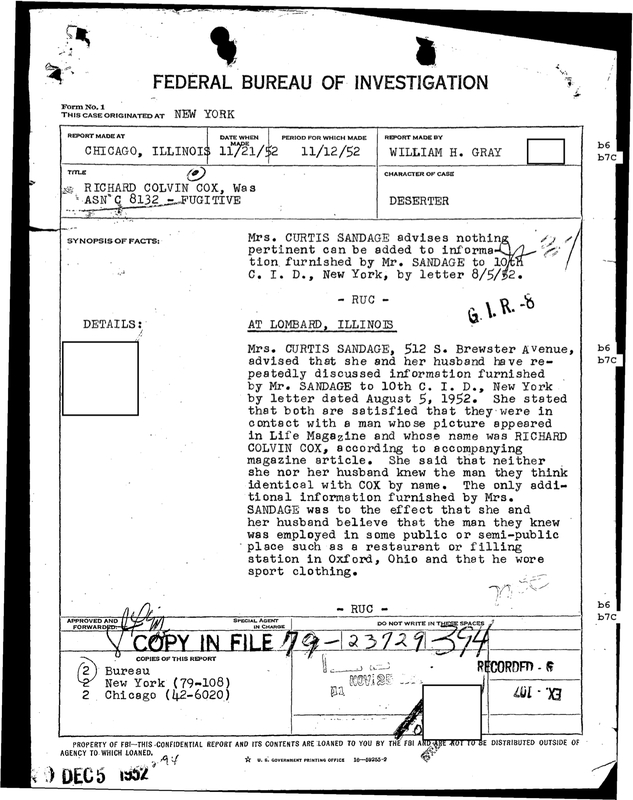 The first document to catch my eye was an FBI report recounting a visit to the home of Mr. and Mrs. Curtis Sandage, of Lombard, Illinois, by agent William H. Gray. The report was dated November 21, 1952, and the visit was in response to a letter that Mr. Sandage had written to the Army’s 10th Criminal Investigation Detachment in New York, NY, on August 5, 1952. A few details of the letter were included, such as the fact that the couple had recognized Cox’s photo from a recent article in Life magazine. Although Mr. Gray didn’t specify the date of the magazine, I can tell you that it was the April 14, 1952 issue. The article can be read here (albeit not easily), beginning on page 147. For closer view, click on link. As the letter states, the Sandages, who were both faculty members at Miami, remember seeing Cox (or someone who looked like Cox) between January and September 1950, before they moved to Illinois. During that same winter and spring, Ronald Tammen was a junior in high school, and, that September, he was just beginning his senior year. If it were Richard Cox and he was pumping gas over the next couple years, when Ronald Tammen was at Miami, I’d think that the chances would have been pretty good that they would have bumped into one another, especially since Tammen was one of the few students with a car on campus during his sophomore year. Those are a lot of “ifs,” I know, but it’s interesting to ponder. The Sandages have both passed away, however, I contacted a son to find out if he was aware of their potential sighting of Richard Cox. He was interested, but knew nothing about it. I won’t be discussing Jacobs’ theory regarding what may have happened to Richard Cox in this post. Cox’s family feels strongly that the assertions made in his and Maihafer’s book are untrue, so I’ll be steering clear of that debate for now. I will say this: Nothing I read in the FBI files indicated that they had followed up on the Oxford sighting after the November 1952 visit to the Sandages’ home. (The pages I’ve received from the Army don’t mention the potential sighting.) That also means that I’ve seen nothing to indicate that the FBI had ruled out whether the person in Oxford might have been Cox. There’s a chance that Richard Cox and Ronald Tammen may have known one another or perhaps had a common acquaintance. It’s also possible that their disappearances might have been related to one another. It’s intriguing how, just five months after their visit with the Sandages to discuss a possible sighting of Richard Cox in Oxford, Ohio, the FBI was brought in to search for Tammen, who happened to disappear from, of all places, Oxford, Ohio. If anyone at the FBI wondered if there was a connection between two high-profile cases of missing college men and the town of Oxford, they didn’t put it in writing. What does their story tell you? Personally, I have trouble processing any scenario that involves him leaving voluntarily – or at least on a permanent basis. I think if he was going to do something like that, he would have taken his car and at least let someone know so his family wouldn’t worry as much. I think something really bad would have had to happen right before, something that really scares him to the point of hiding from everyone, and from all accounts of the lady people to see him, nothing happened. But that’s just based on what you’ve said about his personality. If the FBI has confirmed him dead, that almost has to be what happened. I think if Cox really was seen in Oxford after his disappearance, it would suggest that Cox had left voluntarily. But I can’t put a finger on how that would lead Ron to disappear. Perhaps an altercation between the two that got out of hand? Could the older woman he was reportedly seen leaving with have been Cox’s wife or girlfriend? Strangely, the only reason I had ever heard of Cox’s case prior to your blog, was that the possibility was raised that the mysterious George in the Anna Christian Waters case could have been the same George in Cox’s case. I think that idea was pretty much discounted though because that George was living in California already by the 50’s. Thanks so much for these thoughts. It’s definitely a conundrum! Yeah, that’s definitely a popular theory. But I’ve spoken with a number of his fraternity brothers, who all say “no way,” and I find them to be very credible. Be sure to stop by April 19–I’ll be posting documents that provide what I consider to be a pretty major plot twist. Lady = last. I hate autocorrect. Your research is absolutely incredible. I always feel like a kid on Christmas morning when one of these Updated BLOG email notifications appear in my INBOX! Your research is absolutely amazing; I look forward to the next installment!!! Thank you! So glad you’re enjoying reading them as much as I like writing them! So glad to find the site. Every 6 months or so, I do a google search of Ron Tammen to see if anything is new. I had read of your pursuit in The Student, maybe the Oxford Press, the memory isn’t what it used to be, and am pleasantly surprised to see some actual progress made in the case. I appreciate the professional presentation also. I’ve experienced those dreadful amateur investigators on a couple websites that you’ve mentioned, well meaning, but ultimately just noise and a waste of time. The interviews of witnesses are long overdue, and quite welcome. Even if no firm conclusions come of them, it’s sort of a fresh ride through history, and entertaining in its own right. A few thoughts I have: I don’t believe the Seven Mile incident happened. I hate to be skeptical of a Coroner, but I’d have to see the supposed documents to believe it. I think that’s a minor point anyway. I lean toward the frat prank gone wrong theory, but a Code of Silence lasting this long is really unlikely. I know Joe Cella thought Ron just left of his own accord, as you apparently do. I never knew the fish prank perpetrator had been identified, although I never thought that was anything more than a typical college practical joke. As for the Richard Cox matter, the coincidence is mind boggling. It could be merely someone who looked like him, but even then, to happen in Oxford is incredible. Such coincidences do happen, but that one is mind blowing. Love the site, just read everything in it in one sitting-I think. Was August 30th 2017 your first entry? If so, I read it all. Welcome! And thanks so much for your comments. Actually, I started this blog in April 2016, so there’s still a little more. You can get to the older posts by going to the top menu, clicking on “blog,” and then scrolling down. The first post is titled “Seeking Grace,” and it’s about my search for the girl Ron took to his senior high school prom when all I had to go on was a first name and two photos. (Spoiler alert: I found her!) 🙂 I’m especially happy when a longtime Ronald Tammen aficionado discovers this site. If you haven’t done so already, you may wish to subscribe to the blog. That way, you’ll get an email whenever I post something new. Again, welcome! Wow, it just hit me as I was checking NFL football scores, who Ken McDiffett was. Funny how the mind works. I was a freshman at Collins Hall in 79, and he came by one night and shared his thoughts on Miami in general, and the Ron Tammen case in particular. It surely was him, although I couldn’t have recalled his name. But I recall him identifying himself as the former chief RA or SA, or some title, at Collins Hall. He mentioned the phantom of Fisher Hall, and I distinctly remember him saying the singer was a baritone. He didn’t seem to think it was anything more than a college prank, and passed off the thought of super speed or such, and that people were a bit afraid to catch the Phantom so they weren’t trying all that hard to catch him. I also recall him mentioning that he and a friend buried a glass jar of either golf or ping pong balls, depending who you asked, behind Collins. The two of them jokingly referred to it as “The Treasure of Collins Hall.” He said he’d made a half hearted effort to dig it up once, had failed, and offered any of us who wanted to, a chance to go digging for it. Of course, he was asked for his opinion on the Tammen case, and while he didn’t seem to hold a strong opinion of his own, he affirmed the general consenus as a case of amneia. Not sure what any of this means, but I was delighted to realize who that person from almost 40 years ago was. I am sure the people directly involved in the event have much stronger emotional responses, whether good or bad, upon hearing from you. Very interesting. Unfortunately, I never got to meet Ken McDiffett, though I’ve heard he was a great guy. His wife is wonderful too and has told me as much as she can rememberKen telling her about the Tammen case. Apparently, he had kept lots of records on the case, but they have all been discarded. I totally agree with him that the phantom was likely a prank. Finished reading the rest of the blog. All kinds of thoughts rolling around. The woman from Hamilton, if true, would answer how he got out of town. Someone drove him…seems kind of obvious in retrospect. I have no firm conclusion on that. The blood donor issue……not sure. I am still not convinced he visited the Coroner. It just doesn’t make sense, but as you mentioned, not everything a college kid does makes sense. The singing practice issue strikes me as really important, but I’m not sure why! The missing pillow case does not strike me as important, but I’m not sure why on that one either! I saw what I think is a hint to your working theory a couple times. Okay, letting this all settle in. It’s truly wonderful after all these years to see something new on the case. Awesome—thanks again for visiting and for this feedback! FWIW, the FBI didn’t bring in agents from DC to investigate. They surely were from the Cincinnati field office, odds are the very same people, and were 100% aware of the Cox/Tammen similarities.